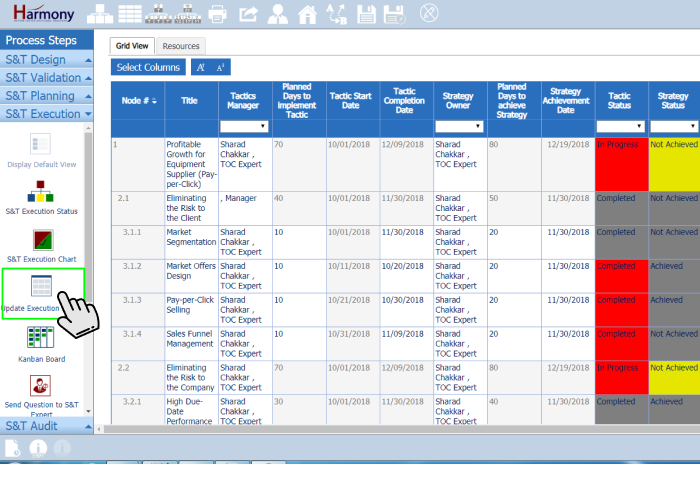 How to view/update Strategy achievement & Tactic implementation status in Grid View? On the previous page, we showed that by using “S&T Execution Status” you can use the S&T to view the execution status of all Strategies and Tactics. You can view/update more details related to execution status by clicking on “Update Execution Status” left menu icon. You will see the S&T node details in Grid view where you can do inline editing to update more details related to execution status. 1. You can view/update more details related to execution status by clicking on “Update Execution Status” left menu icon. You will see the S&T node details in Grid view where you can do inline editing to update more details related to execution status.